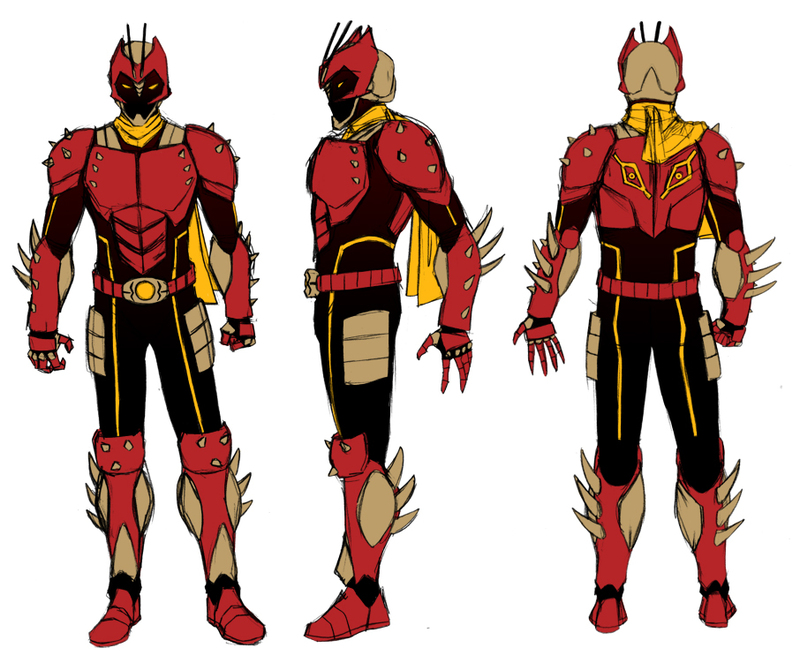 Kigan started as your usual Rider: got kidnapped by an evil organization, transformed into a Rider, meant to be brainwashed and become the Blood King escaped before process completion (thus making him retain his mind and human form). He started off battling the criminals and forces of evil around his city, however, as trouble started to increase, people started doubting the hero and his gruesome fighting method and the destruction caused by his enemies which, in the eyes of the observers were there with the sole reason of exterminating Kigan. Turd really hit the fan when Kigan's nemesis, Korusu Senshi, appeared, not only he was another Rider himself, but he also bore a close resemblance to Kigan. After causing much destruction and kidnapping many townsfolk, the situation only worsened when both Riders started their battle, causing even more harm to the town and causing some casualties. After the lengthy and bloody battle, Kigan stood victorious; but there were no cheers from the locals for him, only curses due to the disgrace and death "caused" by him and the distrust as this occurrence made everyone realize that Kigan was actually more powerful than all the monsters that appeared so far and, even worse, he was a Rider just like , meaning that someday Kigan could become a threat to everyone. This whole episode chased family and friends (who knew about Kigan's situation) away from him, which caused trouble since he often needed to skip work or something similar in order to face a new monster, which was easily done with family and friends backing him. As time progressed, Kigan became mentally weak from overworking to the point of being unable to make sharp decisions, which made him unable to stop a monster from eating all the children who were gathered at the local primary school. After this, everyone was so distrustful that Kigan decided to leave his hometown once a new hero appeared. However, word of his deeds had already spread and wherever he went, he was treated as a villain instead, he wandered aimlessly, trying to amend his reputation by fighting random baddies, but nothing seemed to work....details of his secret identity leaked out, so work was hard to obtain, at some point, he decided to stay in Rider form permanently, since such form makes him virtually invincible to everyday needs (no need for food, bodily functions, limbs regrow, never gets tired, etc, though he still needs to sleep). One day, he heard about a certain city called Void, full of criminals and heroes about as bad or destructive as the criminals, on top of that there was supposed a tournament of Henshin Heroes, a perfect chance to prove himself as a strong and capable defender of justice, so he set his course there. Powers: Just like most Kamen Riders, Kigan has an array of "rider" attacks, such as Rider Punch and Rider Kick. His finishers however are Rider Chop (a head-to-toe powered chop that slices the opponent in two) and Rider Axe (a beheading inverted roundhouse kick). Also, unlike most Riders, his fighting style is not around punches and kicks, but at grappling, immobilizing and disabling/dismembering instead, mimicking the style of a Praying Mantis in which Kigan is based. Another power is his Preying Gaze, which consists in 2 eyes "painted" on his back which causes anyone staring at them to feel an inexplicable fear, perhaps enough to turn around and run away. Overall, against powered beings such as monsters and heroes this pretty much only prevents Kigan from easy sneak attacks from his back since even heroes tend to hesitate a bit due to fear. Kigan can not turn giant nor has any sort of "giant" power or equipment, when facing giant opponents however, he will take advantage of his small size and enter the opponent's body, causing internal damage to vital organs, eventually killing the giant being. Weaknesses: Despite being stronger, more resistant than normal and able to regrow limbs after some days, he is by no means impervious, he can totally be harmed, but the worst weakspot is his Kigan Stone (the stone in his henshin belt), which if damaged can disrupt his powers, making him weaker, unstable or, even worse, revert to human form. OBS: Kigan will never leave Rider form, when he reverts back to human, anything that should have happened to him (hunger, physical stress, amputations, etc) happens at once and he has been in Rider form for so much time he is afraid that he will die instantly if he reverts.